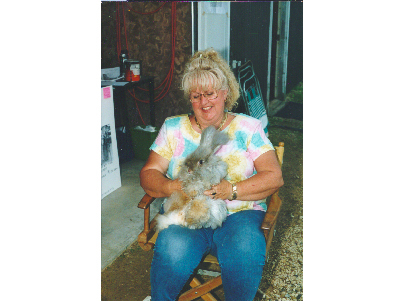 I, Sheran, raise rabbits for pleasure, meat and wool and have been doing so in west central Wisconsin since 1978. Between about 1978 and 1983, I raised Zecca Rex Royals for pelts and meat. That was before the environmentalists started spraying red paint on people's fur coats. We had a rabbitry capable of supporting 1500 animals and had gotten up to 350 rabbits by the time the bottom dropped out of the fur market. After that, we built a new, smaller rabbitry. It is insulated, has electricity and a hefty fan on a timer to keep temperature and humidity under control. It holds about 50 rabbits. We started with new cages, and new, varied breeding stock. -and to turn any that don't sell into fryers. I usually buy pedigreed rabbits so I have high quality stock to sell. Sometimes, when things get out of control, we will take 10 to 40 rabbits to a local processor and put them in the freezer. 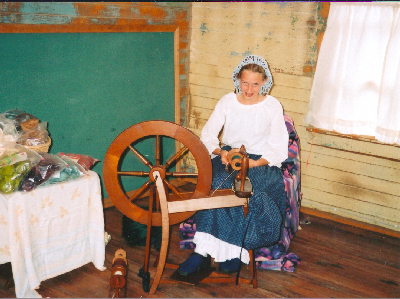 This is my granddaughter Tina spinning in the old Bell School building at the Little Log House Threshing Show in Hastings, Mn. Unfortunately, that building and two others in close proximity mysteriously burned to the ground in 2016. 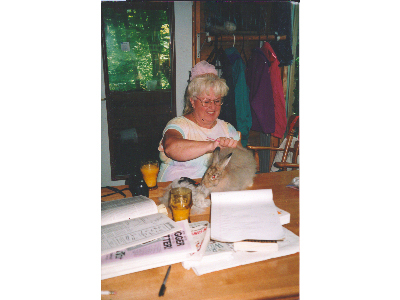 I had to interupt my rabbit-raising process in 2008 because I broke my shoulder one rainy night on my way back to the house after feeding them. It was pretty ironic, because I was scheduled to have a knee replaced at 7AM the following morning! So, we contacted the hospital and asked them to get out their "shoulder" tools instead of their "knee" tools, which they did. Since I was so badly laid up, I had to give all my rabbits away while I convalesced. About 5 months after that, I had both knees replaced. I was without rabbits from June of 2008 until the fall of 2009, but now I'm back at it again! 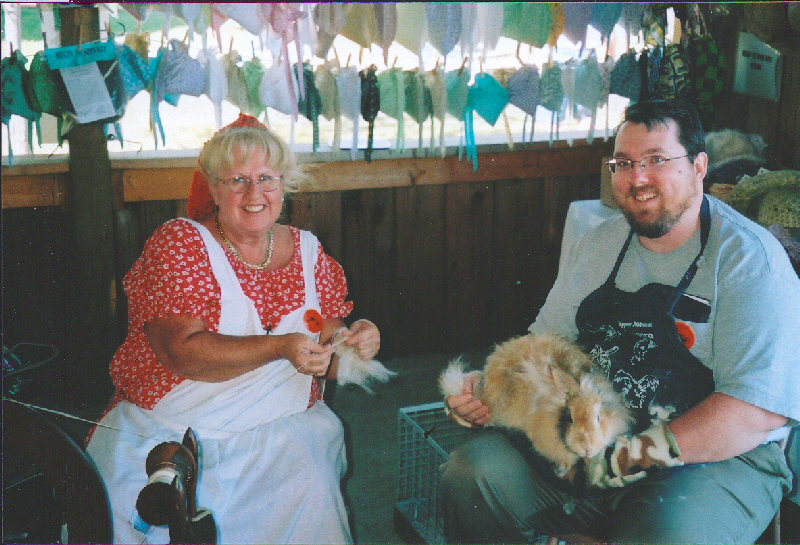 I love spinning Angora and demonstrating spinning with a bunny on my lap. Check my "Spinning" link, above. I'd like to hear from rabbit enthusiasts with similar interests, particularly in the east central Minnesota and west central Wisconsin areas.